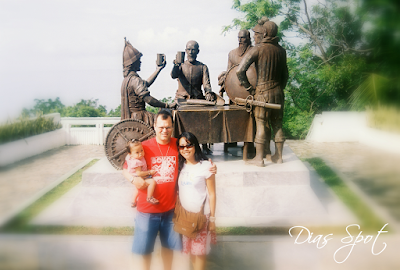 This photo was taken during our visit to Bohol, Philippines a few years ago, and Akesha was 13 months that time. Behind is the famous Blood Compact monument. The blood compact or sandugo means that "since the same blood now flowed in their veins, they had become members of the same family, bound to observe loyalty to one another." In other words, Sikatuna and Legazpi became blood brothers by virtue of the rite. The Sikatuna-Legaspi blood compact is considered as the First Treaty of Friendship between peoples of different races, religious, culture and civilization. It was a treaty of friendship based on mutual respect and equality.